IN JANUARY 1555, John Rogers—Bible translator and Protestant preacher—was being led to the stake. He was asked once more if he would recant. He replied that what he had preached he would seal with his blood. “Then thou art a heretic,” the sheriff replied. “That shall be known at the day of judgment,” said Rogers. “Well, I will never pray for you,” said the sheriff. “But I will pray for you,” replied Rogers. Rogers was the first of some 290 Protestants executed during the reign of Mary I, so-called “Bloody Mary.” Mary, however, was no more “bloody” than other monarchs of the time—perhaps less so. Henry VIII is said to have executed more than 70,000 people in his long reign, for all sorts of reasons. But Mary’s persecution was singularly ineffective: after her reign, Protestantism regained the crown, never to relinquish control of the nation again. In spite of its mixed success, religious persecution was a common form of social and political control in the sixteenth century. Why? And why, in the case of Mary I, did it fail? It was universally assumed that there was such a thing as true doctrine, and that to reject it carried the sentence of spiritual death. To force the heretic to recant was an act of mercy. Edmund Bonner, the Marian bishop of London later castigated by John Foxe as “bloody Bonner,” observed that if such treatment persuaded the heretic to abandon erroneous ideas, he or she would have been saved from the death of body and soul. If a heretic refused to recant and was finally executed, it was never claimed to be of benefit to the victim. The only people executed were the relapsed and the recalcitrant—those beyond hope of redemption. In such cases, there were two reasons for the capital sentence. First, heresy was blasphemous and constituted treason against Almighty God. Both blasphemy and secular treason carried the death penalty. Second, innocent souls might be corrupted and lost if heretics were not silenced. Heresy was seen as a social disease, and those who were irredeemably infected with it were carriers and must be destroyed. England also promoted political identity by religious means; this was true of even Henry VIII and Elizabeth I. The English celebrated the repulse of the Spanish Armada (1588) by striking a medal inscribed Flavit deus et disipati sunt (“God blew, and they were scattered”). Sir William Cecil, a leader in Elizabeth’s government, was being disingenuous when he said no one in England was executed for being a Catholic but only for being a traitor. To Queen Mary and Cardinal Pole, then, the imprisonment and burning of Protestants was not a policy but a duty. They consequently ignored all evidence that indicated they were failing to have the desired effect. Mary’s Lord Chancellor, Bishop Stephen Gardiner of Winchester, was one of the few who saw what was happening. He was no more tolerant of dissent than the queen, and initially he shared her contempt for the Reformers. But the public’s reaction to the first burnings changed his mind. Instead of being cowed and discrediting themselves by surrender, the likes of John Rogers and John Hooper were dying with courage and exploiting their sufferings in a disconcerting manner. After a few months, according to John Foxe, Gardiner “gave the matter over as utterly discouraged,” and began to seek less dramatic means of coercion: imprisonment, civil disabilities, and exile. But by the time Gardiner died in November 1555, it was clear he had failed. For the remainder of her reign, Mary continued her persecutions, inadvertently gaining more sympathy for Protestantism. 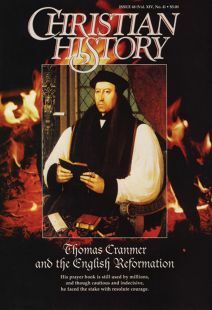 Even Thomas Cranmer, the most loyal of subjects, was driven to defy his lawful sovereign. Distraught that his faith was considered treasonable, the fallen archbishop recanted, and then, fearing the fires of hell more than the wrath of princes, withdrew his recantation and died a martyr. Making a hero out of this unheroic man, the queen and the cardinal unintentionally demonstrated the limitations of persecution. Such violence could be effective against small, dissident minorities, especially if they were unpopular. The Spanish Inquisition was successful not because of its exceptional ferocity or ruthless efficiency but because it commanded the overwhelming support of the aristocracy and people of Spain. In the reign of Philip II, it was alleged that 20,000 voluntary informers provided the Inquisition with information. Autos da fe, at which the penitent were reconciled and the impenitent burned, were popular spectacles attracting thousands of enthusiastic onlookers. It was the shame of public humiliation as much as the fear of fire that drove the accused to confess and submit, even when they were not clear about the charges against them. In February 1486, for example, no fewer than 750 penitents were reconciled in the Toledo cathedral. When they were told they would never again be eligible to hold an office or position of public respect, the crowds cheered. Such demonstrations did not take place in England. It was not that the English were squeamish—public executions attracted large crowds. But heresy did not arouse public indignation as it did in Spain. Neutral observers testified that in 1555, English spectators were more likely to sympathize with the victims than to execrate them—especially if the victims handled themselves with courage. This did not necessarily mean there were large numbers of covert Protestants scattered throughout England, but clearly the largest number of executions took place in London, an area that had embraced Protestantism far more warmly than most parts of the country. In seeking to make an example of the heretics where it would be most effective, the authorities miscalculated and, to the contrary, encouraged defiance and evasion. Charles V’s English ambassador exaggerated when he claimed that the realm was riddled with heresy, but positive enthusiasm for the Queen’s proceedings, particularly the persecution, was in short supply. Queen Mary is remembered not only as the ruler who failed to return England to the Catholic church but also as “Bloody Mary.” Mary’s nearly 300 executions might soon have been forgotten if it had not been for writer John Foxe. Driven partly by religious zeal and partly by what can only be described as humanitarian indignation, Foxe set out to celebrate the martyrs of English Protestantism, and in the process, to pillory the previous regime as a clique of murderous hispanophile gangsters. It is hard to overemphasize the impact his Acts and Monuments had the twenty years following its 1563 publication. By the second edition (1570), it was part of the national myth, which was growing partly spontaneously and partly by official encouragement. Foxe provided both a history and theology for the triumph of the Reformation and, perhaps unintentionally, a national ideology, as well. A persecution will succeed if it produces only victims, and if it targets a small, unpopular minority at that. It may succeed if it produces only martyrs. But it will certainly fail if it produces martyrologies. David Loades is professor of history at the University of Wales, Bangor. He is author of The Reign of Mary Tudor (London, 1991). Christianity in one Spanish village—a historical re-creation.